You are here: Home / Mental Game of Soccer Role / Mental Game of Soccer Tips for Players / Are YOU Mentally Prepared for Soccer Games? Are YOU Mentally Prepared for Soccer Games? Do you or your soccer players wait until after the first few plays of the game to feel confident? If you don’t have a great warm up, does this affect your mindset for the game? Do you have doubts or worry about making mistakes and play safe or tentatively? We’re sure you have a physical pregame routine, but do you use this time as a mental warm up too? Shooting on goal, hitting long balls, playing possession, and dynamic stretching are imperative to prepare for competition. What’s missing? A mental warm up to instill confidence, shake off anxiety, and focus on the game plan. 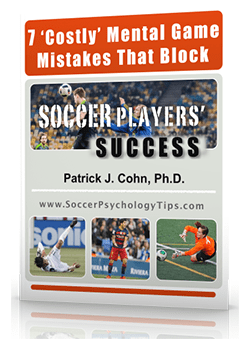 Most coaches and players agree that a big part of being successful in soccer is mental, though fail to implement a routine that includes mental preparation. As a result, you might feel ready physically, but not fully prepared mentally because of low confidence, inability to trust skills, performance anxiety, or trouble performing under pressure. We teach our soccer players that starting a soccer game without a mental warm up routine is the same as showing up five minutes before the game and skipping all of the stretching and other physical preparation. This approach would inevitably lead to a poor performance at best and injury at worst. In the same way, failing to mentally prepare will hurt your performance and can injure your confidence. Have you heard a parent or coach say “get your mind right” or “start getting mentally prepared”, but don’t know how to mentally prepare? 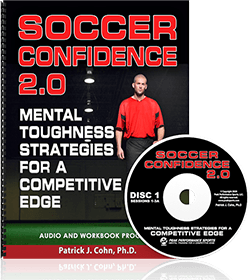 We believe that the number one reason soccer players don’t have a pregame mental routine is because they don’t know how to implement one. In addition, unlike an actual physical injury, mental scars cannot be seen and therefore are often avoided or ignored until it becomes too late. At Peak Performance Sports we work with our soccer players on how to create a pregame routine that prepares them to play with confidence, trust, composure, and mental toughness. Contact us to learn how we can improve your mental game by creating a custom pregame routine and implement other important mental strategies that will help you succeed in soccer. 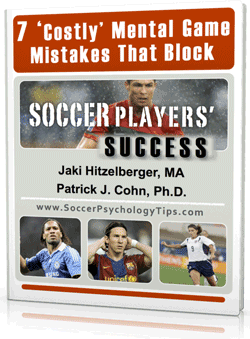 You can also download our free ebook “7 Costly Mental Game Mistakes That Block Soccer Players’ Success” and learn how to overcome other mental barriers to peak performance. Great point. You need to get everyone focused and ready for the game at hand and a mental warmup is crucial. Getting your players to forget about the last game and focus on what is happening right now is so important to success. I don’t have trouble getting over previous loses but i do however find it difficult to focus on playing one play at a time and not focus on not making mistakes,i constantly find myself thinking of what others’ impression of me is if i make mistakes.How do i get over this?